Three more dates have been added to LaPintoresca Library’s Chocolate Storytime! They will be on the last Friday of each month: March 28, 2014, April 25, 2014, and May 30, 2014 at 4:00 p.m. There will be special guests from the community and exciting arts and crafts activities. So continue to join us and bring friends with you. There will also be short optional surveys for parents to fill out, to share their thoughts of each of the books we read. Also, we will get the help of older kids with puppet shows and finger plays. In essence, Chocolate Storytime will be a fun event for the entire family! 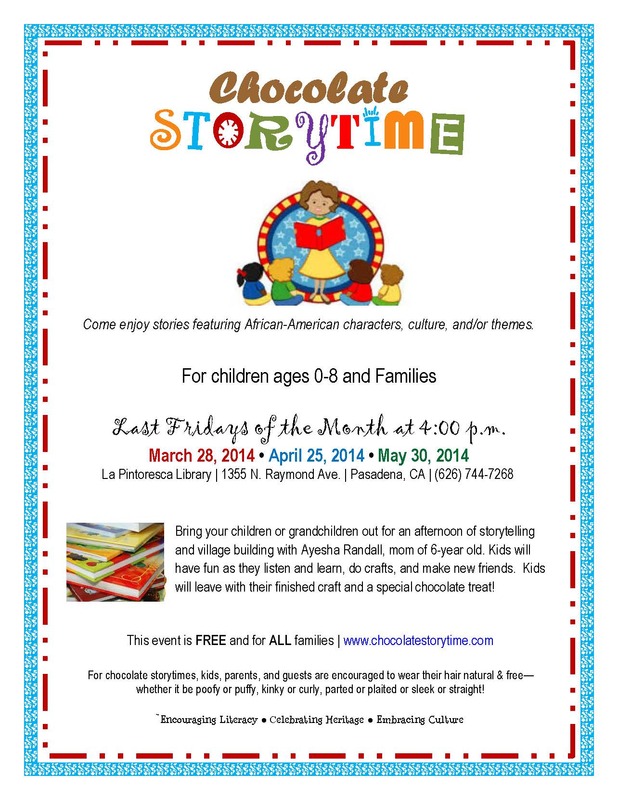 To download a PDF of the flyer, click this link: Chocolate Storytime Flyer. For more information, please call LaPintoresca Library at (626) 744-7268.